Over the last 15 years we've raised $1.1 billion SGD for men’s health. Every year we publish financial information so you can see your donations at work. In 2017 the Movember community championed men’s health in 20 countries across the world. Through the growth of more than half a million moustaches we raised SGD $93.9 million. These donations allow us to raise awareness, invest in vital men's health initiatives and run Movember each year. Globally, we're tackling some of the biggest issues affecting men: prostate cancer, testicular cancer, and poor mental health and suicide prevention. 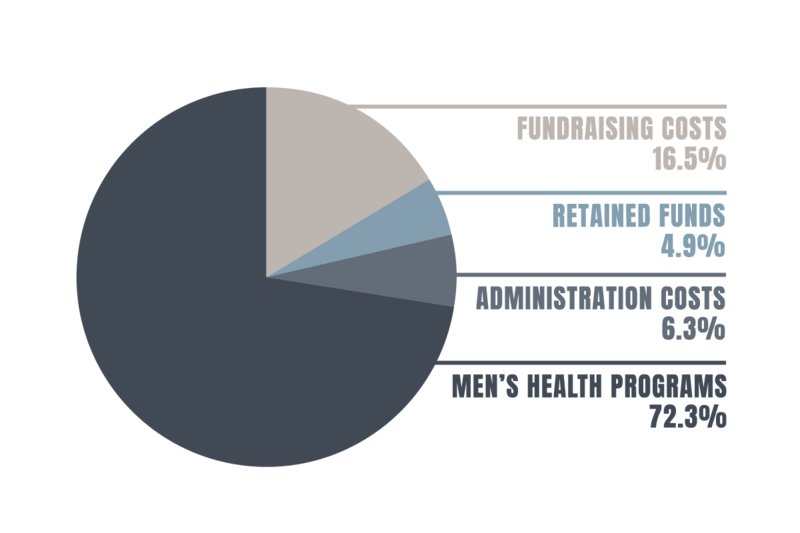 Distribution of funds from the international 2017 Movember campaign saw 72.3% allocated to men’s health, 4.9% to retained funds, 16.5% to fundraising costs, and 6.3% to admin costs. Our focus on costs and economy of scale has resulted in a global cost-to-funds-raised ratio of 22.8%. Throughout our history we’ve stayed committed to high levels of efficiency, transparency and accountability. Each September we publish an annual report detailing the previous year’s campaign, financials and outcomes.